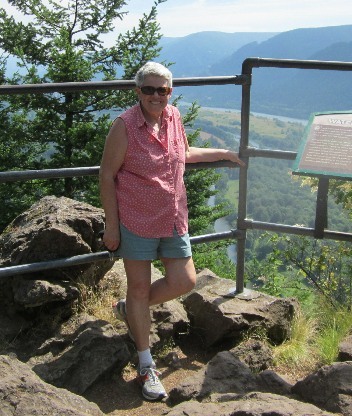 Our time at Beacon Rock was a real delight. You’re in the middle of the mountains, with evergreens all around, bright warm sunshine and friendly people. 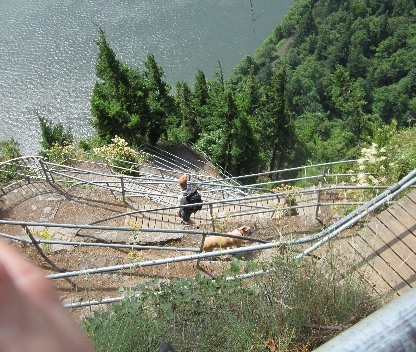 During our first full day there, I climbed Beacon Rock (an easy trail with 52 switchbacks up to the top.) The views were so beautiful and the hike so pleasant, that I persuaded Craig to come with me for a repeat on the second day. 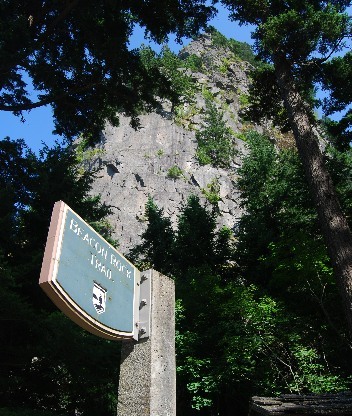 Henry Biddle bought this thumb of rock, 850 feet high, for a dollar in 1915. 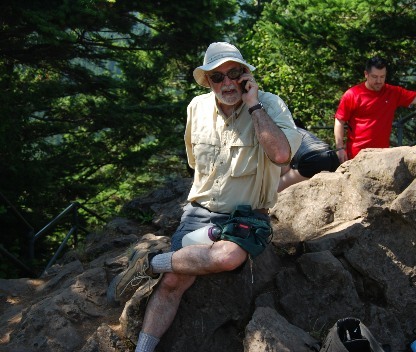 His sole purpose was to build a trail to the top, which he did during the next three years. 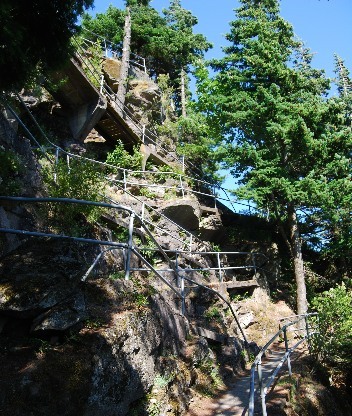 The trail is somewhat of an engineering marvel, with dynamite-blasted ledges, level concrete trail surface and hand rails most of the distance. A few of the original railings, with Edwardian decorative touches, have been salvaged at some of the corners. Sometimes, where there’s not enough space for a traditional switchback, bridge sections are built out from the cliff, supported by massive steel beams. 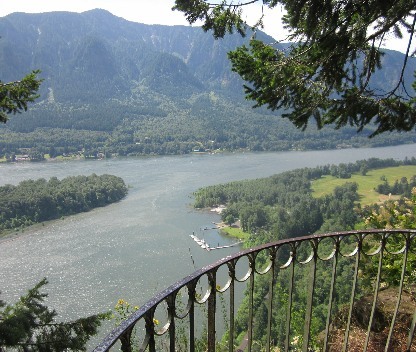 We looked down from the many viewpoints toward our boat below, and toward the Bonneville Dam, our next destination. Our number one concern about reaching the dam, which I mentioned in our last trip report, was that the river current might be too strong for us to make any progress at all. On Friday we got a report from Wind Raven, a 42 foot sailboat, that they made it just fine, always able to make at least one knot over the ground. That provided considerable reassurance, because in theory with our two additional feet of waterline length, we should be able to go just a bit faster. Mark and Fern arrived Friday evening to spend a couple of days with us, and to help us through the locks. What a grand adventure! We took the time to pump up a couple more bumpers. (All advice is to deploy ALL your bumpers). These particular bumpers were manufactured with their valve so far sunk in that an ordinary bicycle pump equipped with a ball-inflation needle couldn’t reach it. Craig, Mark and Fern cobbled together a system that involved detaching the ball-inflation needle, jamming it into open the valve, and then holding down the end of the dinghy’s air pump over the opening with brute force. When they did finally get the bumper inflated, some quick work dismantled the system quickly enough that not too much air was lost. The lockmaster finally opened the swing bridge, opened the lock gates, then gave us the go-ahead, the traffic light turned green, and we headed into the lock. We threw lines over the floating bollard as instructed, and waited for the gates to close. Once that happened, we started to rise, about an inch per second. The whole process took probably only 20 minutes; then the gate opened at the other end, the light turned green, and we motored out. All in all, pretty painless, and a great experience. We were the only boat in a lock that could have easily fit 30 boats our size. There’s no charge for going through the locks, probably because boats have a historic right of navigation superior to any other use. 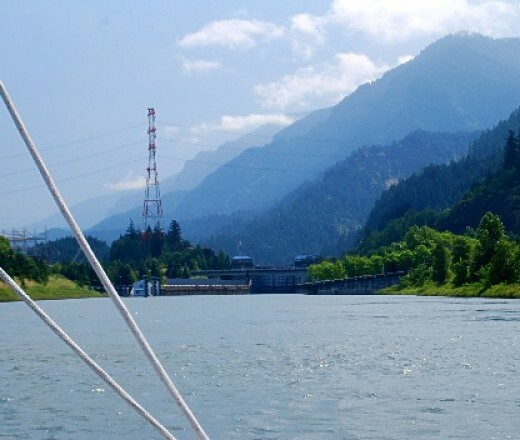 When the dam was put in, it imposed limits on existing rights of boats to go up and down the river – although to be fair, it made it much easier. Apparently there were some fairly wild rapids in the area of the dam, and most travelers (including Lewis & Clark) portaged around that stretch of river. Putting in the dam and the locks made it possible for boats to get through that stretch of river much more easily. 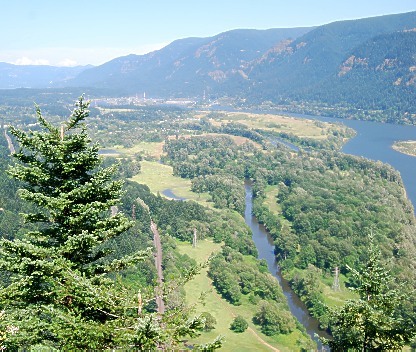 It’s only three miles from the top of the dam to the town of Cascade Locks. 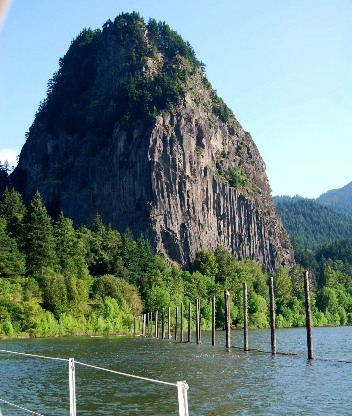 On the way there, we passed under the Bridge of the Gods and saw dozens of Indian fishing platforms (all unoccupied). 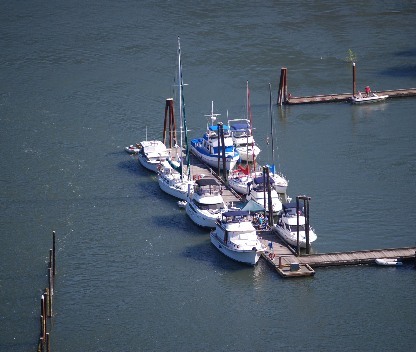 The marina was pretty full, and we had to partially overhang into the holding tank pump-out zone. The harbormaster didn’t seem to care, and we were eventually able to move mostly out of the holding tank zone. We walked up into town through the narrow car tunnel, and found the East Wind Drive-In. Our marina neighbors on Wind Raven had told us we must each have one of the drive-in’s $4.25 waffle cones. The drive-in line was out into the street, as was the pedestrian window line. People came away from the window with eight-inch high columns of soft-serve ice cream perched on a cone. Or, you can have them pump the ice cream into a tall drink cup, and they’ll stick the cone on top. Fortunately, we found out, you can get a children’s cone, which is what anyone else would call an ordinary size cone. Milling around the drive-in were a crowd of motorcyclists (“Bikers for Christ”) and lots of tourists. We pictured a huge underground tank full of ice cream – they were dispensing so much of it. We had dinner at the Pacific Crest BrewPub – pizza and burgers. That was followed by a couple of killer scrabble games with Mark and Fern back on the boat.